Well, that didn’t take long. Just yesterday, we reported macOS High Sierra 10.13.5 had yet to be released. But Apple has officially rolled out the new update as of Friday morning, June 1.
macOS 10.13.5 is a relatively small update, but it introduces a long-awaited addition to the Mac operating system: Messages in iCloud. The feature does exactly what its name entails, and it has a variety of benefits. It frees up quite a bit of space on a Mac drive since all messages are stored in the cloud. But it also allows for seamless and smooth iMessage synchronization across a user’s device ecosystem. If you delete a message on your iPhone, that same message will automatically be deleted on your Mac and iPad as well (provided that they’re running the newest update and Messages in iCloud has been enabled). 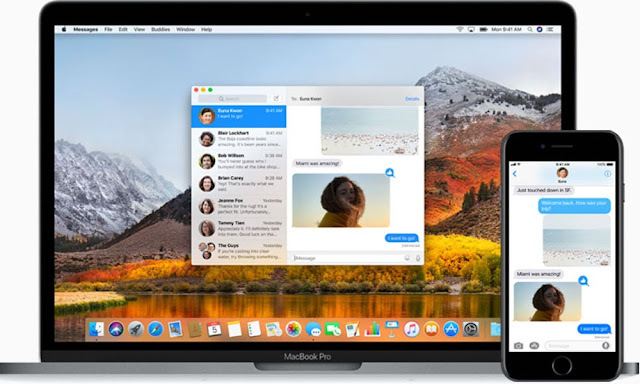 Messages and iMessage history will also automatically appear on a new Mac when it’s set up under an iCloud account. Previously, users needed to restore their Mac from a backup to get their message history synced. The new cloud-based feature was also released for iPhones, iPads and iPod Touches earlier this week in iOS 11.4. As with all macOS updates, 10.13.5 also includes a number of under-the-hood improvements and security fixes. Apple has squashed a handful of bugs and patched numerous security holes in the previous version of macOS High Sierra. Several of these vulnerabilities allowed users to be tracked by malicious websites, or for third-parties to execute code with kernel privileges. In layman’s terms, your Mac should be a bit safer once 10.13.5 is installed. If you’re interested, you can read more about the security content of the new update here. macOS 10.13.5 should now be available for all Mac users currently running macOS High Sierra. It can be downloaded from the Mac App Store. Messages in iCloud can be enabled by opening the Messages app and navigating through Preferences > Accounts. In that menu, click the checkbox next to Enable Messages in iCloud to turn on the feature.